This manuscript gathers together several devotional and moralising writings, in Latin, English, and French. It was probably made for churchmen at the Cathedral, Norwich. It may have been useful to them in composing sermons and teaching as well as for as an aid to personal prayer. A set of prayers written on the book's first pages include the Creed, Lord's Prayer, Hail Mary, and other prayers in English verse. 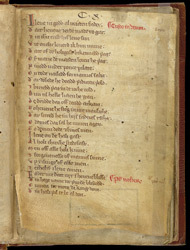 In the margin, the red titles mark the beginnings of the first two prayers: "Credo in Deum" (Apostles' Creed) and "Pater Noster" ("Our Father" or Lord's Prayer). The Creed begins, "I leue in Godd almicten fader / Dat heuene and er6e made to gar."